On Monday, March 26, 2012 the president of one of Rocinha’s three residents associations (AMABB) was shot and killed. Vanderlan Barros de Oliveira, known as Feijão, walked a short distance out of the association’s headquarters when he was shot at five times in broad day light by a man on a motorcycle wearing a helmet. Three of the bullets hit him, two in the back and one in the neck. He died almost immediately. Vanderlan, who was 41 years old, left behind 4 children, including a new born baby girl. His assassination follows a week in which residents of Rocinha living in the vicinity of Rua 1, Terreirão, Rua 2, Macega, Valão and Roupa Suja heard the sound of gunfire for 3 nights in a row. The relative ‘sense’ of stability brought on during the change of power, from the heavily armed drug traffickers to the state sponsored UPP, or Pacifying Police Units, is proving much shakier than many had anticipated – in fairness Rio’s state police insist that they always expected this to be a challenging process (Beltrame: é ingênuo achar que não haverá problemas em ocupação). Another recent report stated that Rocinha is going through a period of ‘re-stabilization’. (Rocinha passa por fase de estabilização, diz especialista ) Did anyone really believe that deeply entrenched drug traffickers would concede so easily, or that the associated subculture of gang life, violence and corruption would disappear overnight? Knowing that the invasion of the police in November of 2011 was imminent most of the traffickers fled to other favelas in Rio de Janeiro that are controlled by the same criminal faction. After the dust began to settle, not long after the New Year, many of them started returning to Rocinha, little by little. Now, in March 2012, the police admit that there has been an increase in the number of Rocinha’s drug points (Polícia investiga aumento de bocas de fumo na Rocinha. Traficante Canelão está de volta). In the beginning many of Rocinha’s residents cooperated with the police after the initial invasion and occupation in November, but this is becoming increasingly uncommon. 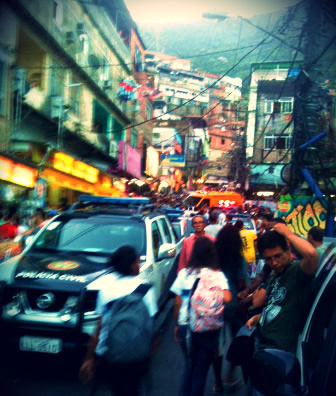 At that time there was general feeling of excitement and positivity in Rocinha regarding the supposed power shift. (Listen to a radio podcast – Favela Pacified – BBC) During the first two months of the occupation there were dozens of arrests, with many made possible because of residents collaborating with the police. Not anymore. Now, most residents are dead silent. Widespread rumors suggest that some of the residents who worked with the police, particularly those who appeared on TV or in the papers, have been killed. There is an increased sense of insecurity, once again, in Rocinha. So where are the police, what are they actually doing all day and night in Rocinha? Wasn’t the plan to create a general sense of security and protection and noticeable improvements in quality of life? Conceivably this could be the very long term goal. Or perhaps the real object was not to pacify Rocinha but rather to rid it of machine guns, assault rifles and other heavy arms. Indeed, the AKs, Uzis and grenade launchers that so absurdly defined daily life in Rocinha have vanished. This is very good for Rio’s political economic elites and stakeholders interested in redefining the city for tourists and investors in light of the upcoming World Cup and Olympics. Is this the true rationale behind Rocinha’s police invasion, and indeed the entire UPP process? One thing is certain the police have only been patrolling the main road of Estrada da Gávea and a few others streets in Rocinha that are navigable by cars and other police vehicles. They very rarely enter the hundreds of becos (alleyways) that wind their way through Rocinha. Distinct even among favelas, the police pacification of Rocinha faces the extra challenge of the community’s difficulty to patrol infrastructure (or-lack-there-of) and topography (Rocinha recebe segundo reforço no policiamento em menos de uma semana). According to a recent report (Rocinha: Plano de Desenvolvimento Sustentável 2010) only 10% of the community’s population live in areas that are accessible by cars or police vehicles (PAC 2010). Before Rocinha’s kingpin was arrested last November the traffickers had hundreds of foot soldiers policing the streets and alleyways 24/7. This was an intimidating and unhealthy scenario but their daunting presence did guarantee a relative degree of peace (or more appropriately ‘false-peace’) than what the police are currently providing. 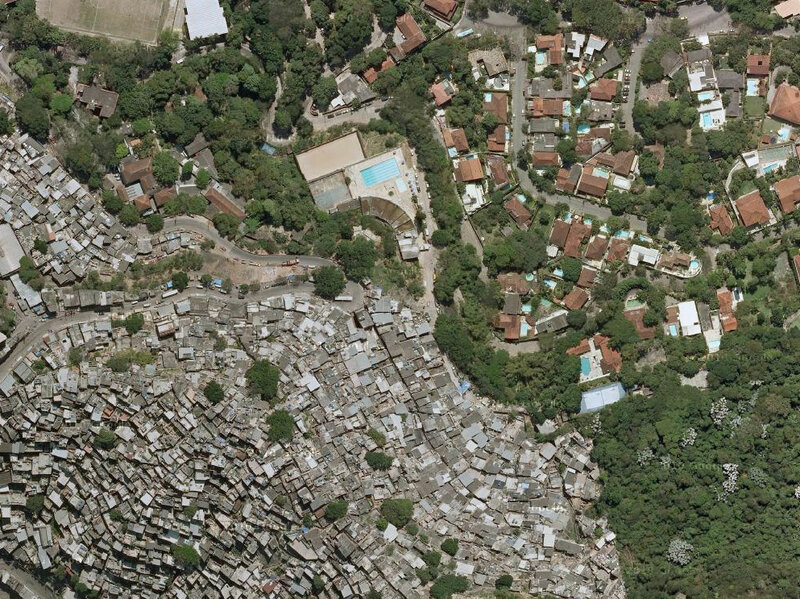 …despite the move to ‘pacify’ this huge favela, corruption (police – traffickers – resident’s associations – outside politicians/politics) has remained largely unchanged. Why aren’t the police entering Rocinha becos and vielas? Our opinion is that despite the move to ‘pacify’ this huge favela, corruption (police – traffickers – resident’s associations – outside politicians/politics) has remained largely unchanged. Several reliable sources indicate that drug traffickers continue dealing large amounts of marijuana and cocaine, and that they continue to bribe police so they do not interfere. In one case, a busy and visible drug point has been operating adjacent to one of Rocinha’s newly constructed public buildings that built with funds stemming from a well known government slum upgrading program – the drug point is only a few dozen meters from a 24/7 police point. What makes Rio deserve such distinctions? In a slight change of direction it is important to note that Rio is a unique city, in numerous enviable ways, from its renowned geography and warm climate to its vibrant culture and enthralling sports (actually just soccer/football). Rio is also famous for some unattractive characteristics. For one, there are few cities in the world where socioeconomic inequality is so glaringly ‘in-your-face’. Hundreds of cities in Latin America, Africa and Asia are home to poverty (slums) as well as opulence (McMansions, gated communities and condominiums). In only a handful of cities, however, will one encounter examples like the northeastern border of Rocinha which is only meters (maybe 35 feet) from the mansions of one of Rio’s most affluent gated communities (i.e. Rua Sérgio Porto and Rua Caio Mário) in Alto Gávea (see photo). Secondly and more important for the topic at hand is the fact that even fewer cities in the world have slums or low-income neighborhoods located in central (financially important) areas of the city where young men openly patrol the streets and alleyways armed to their teeth with weapons manufactured for war. Of course this description excludes cities that are actually experiencing some form of official war or political, cultural or religious insurgency; such as areas of urban Iraq, Afghanistan, Palestine and Syria. One urban area where a comparable scenario of heavily armed youths could be found was in the comunas (slums) of Medellin during the late 1980s and early 1990s (Acero Velasquez 2009), but even then there were notable differences. In Colombia the FARC and ELN, which are self declared “peasant armies” have been engaged in guerilla war with Colombia’s government for decades, and the comunas, especially of Medellin and Cali, were strategic urban points for what otherwise is a rural war over agrarian reform and political economic ideology. 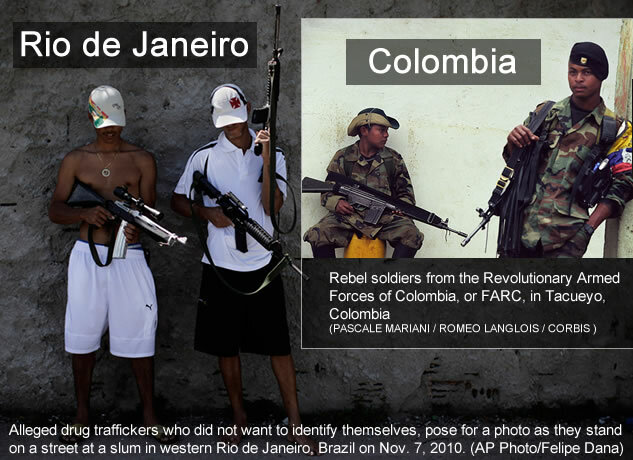 The drug factions that still control hundreds of Rio’s favelas share some resemblance to an urban street gang adaptation of armed rebel groups that are common in many areas of central Africa or Colombia, but they lack any coherent ideology. Rio de Janeiro social geographer Marcelo Lopes de Souza has suggested that a more appropriate description of Rio’s favela drug factions is that they are more like “micro-level warlords” (2009) that asset control over strategic low-income urban areas in a process that he terms “territorialization”. Marcelo Lopes de Souza points out that Rio de Janeiro's "drug trafficking comandos" are "more organized and better armed than the word ‘gang’ could suggest." The visual shock and intensity of Rio’s micro-level warlords has lead to markedly high homicide rates and striking displays of violence since the 1980s. The sheer size of the guns the young men are armed with and the impressive number of foot soldiers patrolling the favelas has been the subject of dozens of movies and documentaries in the last 15 years alone. However, these unique attributes are not necessarily correlated to higher homicide rates. In Recife and Maceio, for example, two sigificantly smaller northeastern coastal cities, the homicide rates are considerably higher than in than in Rio, and have been for years, in particular Recife. Pernambuco, the state Recife is the capital of, has implemented a public security program inspired and guided by PRONASCI that has been in place for 5 years and which many specialists claim is more comprehensive and proving more effective than Rio’s UPP initiative. The program is called Pacto Pela Vida (http://www.pactopelavida.pe.gov.br/), and it has resulted in a significant reduction not only Recife’s but all of Pernambuco’s homicide rates. Recife and Maceio are also cities with hundreds of favelas and criminal gangs operating in them. A few members of Mundo Real’s research team have been conducting ethnographic research in a number of Recife’s more notorious favelas, (e.g. Santo Amaro, Coque, Jordão and Suvaco da Cobra) for over 10 years. These favelas are very intense and dangerous places, with murders occurring every day, although significant progress has been made in the last 4 years. Despite high levels of violence and criminal activity we have never witnessed the kind of heavily armed youth, micro-level warlords and territorialization so common in Rio’s favelas. If official statistics and our ethnographic experience are of any use, then the favelas of Recife are more dangerous than Rio’s favelas, but most of the murders are caused by hand guns, and even knives. Ironically this trend is what has been occurring in Rocinha since the initial ‘pacification’ process began. Increasingly, the morphology of violence that Rio’s ‘micro-level warlords’ represent is being replaced by paramilitary militias (linked to state security forces) and more recently UPPs. In these settings crime and violence begins to resemble forms found in other intense urban areas throughout the world, where hand guns are responsible for most of the deaths and most criminals carry concealed weapons. The famous weekend baile funk parties in Rocinha are a thing of the past. At these raucous parties dozens of gun toting gangsters would show up around midnight, some on foot others on motorcycles, armed absurdly, often with bullet proof vests, a machine gun in hand, pistols in holsters and grenades strapped across their chests and waists. This is the type of scene that made Rio de Janeiro a truly distinctive urban area and a unique challenge for the police, public security authorities and criminologists. This type of display is still present in dozens of Rio’s favelas. Some of the larger favelas where micro-level warlords still dominate with little resistance are, Antares, Jacarezinho, Manguinhos, Complexo de Acari, Morro da Pedreira, Morro do Dendê, Serrinha, Juramento, and others), but with some of the city’s principal favelas increasingly occupied by police or militias, the territory of Rio’s micro-level warlords is decreasingly steadily. What is wrong with Rio’s pacification process in Rocinha? Returning to Rocinha, the 1,500 police officer invasion and occupation that occurred last November happened far too easily, there wasn’t a single shot fired. We are 100% against violence but we are also opposed to political and economically motivated lies. That not one shot was fired alone is barely credible and begs for questioning as to what degree the invasion was a ‘negotiated’ political ploy. Now that the dust has settled and the politicians received their initial fanfare for such a ‘successful’ mega-operation and conquering of enemy territory, the reality and the complexity of power dynamics in communities like Rocinha are becoming more apparent. We ask, if it was so easy to ‘pacify’ the favelas, with so few shots fired, why has this process taken so long to realize, why was this not done 30 or at least 20 years ago when crime and violence began to spiral out of control in Rio? We ask, if it was so easy to ‘pacify’ the favelas, with so few shots fired, why has this process taken so long to realize, why was this not done 30 or at least 20 years ago when crime and violence began to spiral out of control in Rio? Indeed, we find it interesting that the apparently rushed (but decades overdue) PAC favela upgrading program and UPP installations coincide closely with the campaigns of Governor Sergio Cabral and Mayor Eduardo Paes (both of the right wing but ideologically vacuous PMDB) in the current era of mega-event driven development in Rio de Janeiro. PAC, Programa de Aceleração de Crescimento, at the local level, has mainly been administered and implemented by Rio’s State Government (SEOBRAS, EMOP, Casa Civil, etc.). The state quickly subcontracted out most of the work to large private sector development contractors that “coincidentally” had previously donated millions to the governor’s PMDB political party and his 2006 campaign. The UPP or Unidades de Polícia Pacificadora, are largely being funded by the federal program Pronasci, Programa Nacional de Segurança Pública com Cidadania, but is administered by Rio’s state government. Taking a step back, in 2002 Rio won the bid to host the 2007 Pan American Games, the costliest Pan Am Games to date (Gaffney 2010), and this marked a period of substantial shifts in public and private urban development strategies and ideologies. Decision Makers’ wrestled with how to manage potentially risky favelas like Rocinha, situated ‘too close for comfort’. This was particularly so because the Pan Am Games were a litmus test for Rio’s bid to host the 2016 Olympics. In April of 2004 there was a particularly violent shootout in Rocinha that made international headlines, shocking the community and traumatizing the residents of São Conrado, a wealthy neighborhood bordering Rocinha that also pays the city’s highest property taxes. This episode sparked significant civil society activity in Rocinha and São Conrado that has since altered daily life in the community. By late 2007 ‘Rocinha’s development revolution’ was in full swing as certain ‘buzzwords’ (e.g. desenvolvimento,crescimento, participação, inclusão and pacificação) became common. Public investments, civil society organizations, economic activity and media attention greatly increased. Since 2007 new programs and policies have been announced regularly, and within the community’s super dense 0.4 square miles of urban space the full array of development themes can be found. With all of this development activity taking place the tragic rains of April 2010 could not have come at a worse time for Rio’s favelas. With Rio set to host the 2014 World Cup and 2016 Olympics, powerful elites were merely waiting for excuses to begin an era of renewed discourse on forced evictions of favelas in prime real-estate locations (Soares Gonçalves 2012). Via a “de-politicized” geotechnical discourse the notion of ‘areas of risk’ has been reborn and reinforced, affecting dozens of favelas in Rio de Janeiro including certain sections of Rocinha (i.e. the neighborhood of Laboriaux where Mundo Real is located). If we look back to 2004, the minister of sports, Agnelo Queiroz, said that “Any wrong move at this point could impede the possibility that Brasil will host the Olympics.” This was in 2004 before the Pan American games. ( Agnelo: quadro de violência pode impedir que Rio seja sede das Olimpíadas de 2012) In special reference to Rocinha, Angelo goes on to say,”Security of the games is one of the main requirements of the International Olympic Committee (IOC) and the violence of recent conflicts in Favela da Rocinha, in Rio may jeopardize Brazil’s candidacy to host the games.” So in 2004 as well as today we see that it is imperative to control the violence in the favelas or at least appear to be doing so in order to gain international approval to host these games. With these big games on the horizon – now is the time for the politicians to capitalize off of the decisions to install the UPP. The pacification of Rio’s favelas is much more politically motivated than authorities will ever admit. They have rushed through their operations rather than making essential improvements for the general benefit of favela residents. It is the favela residents who suffer the most in these violent transactions taking place in their communities. Competent community policing and participatory slum upgrading are wonderful objectives, but the current PAC and UPP process steadily appear to be occurring in order to please stakeholders and future visitors to the upcoming games, and other dodgy political economic reason, than for a genuine concern for the welfare, security and inclusion of Rio’s poorest and most vulnerable citizens. In Mundo Real’s view the UPPs will never work in communities like Rocinha as long as you have an extremely corrupt police force and high levels of inequality (inter-favela and asfalto as well as intra-favela). So is the UPP a good thing? In theory the answer is a resounding yes! The UPP process, mainly funded and guided by PRONASCI, is intellectually influenced by community policing theory and in particular by the theories put into practice in Colombia under the administration of sociologist Hugo Acero Velasquez while he served as Bogota’s Secretary of Public Security. Velazquez stresses the idea that in order for this type of ‘pacification’ process to be successful authorities have to strive to fight internal corruption of the community police as well as investing heavily in socio-economic improvements that will considerably improve conditions in the community. Velazquez posits that “Security is not simply a question for police and judges; it requires the participation of other forces, particularly social development, to be integrally involved in critical areas with high violence and crime.” In Rio, the former chief of the Civil Police, Helio Luz (who appeared throughout the documentary “Noticias de uma Guerra Particular”) recently said, “The police in Rio are much more corrupt than what is portrayed in the films Tropa de Elite and Tropa de Elite II” (http://www.consciencia.net/o-estado-criou-estes-caras-afirma-helio-luz/). With the inadequacies of the PAC program in Rocinha, and with vast amounts of money disappearing and projects unfinished, where does this leave Rio in regards to a more sincere and transparent vision of development and security? UPPs seem to be functioning somewhat better in smaller favelas like Chapeu Mangueira and Morro da Babilônia. But large favelas like Rocinha require almost an entirely different development and security paradigm. There is no way to ‘pacify’ a city-slum like Rocinha without undertaking the arduous and dangerous task of confronting corruption, the enemy within. No police force, no army, no politician can provide sweeping positive changes in a place like Rio de Janeiro unless they begin the grueling task of battling corruption and thinking about how a peaceful process like the UPP could move forward without being tainted from the start. Battling corruption must also coincide with sweeping changes in socio-economic conditions. Otherwise business will continue as usual, there will always be a long line of disenfranchised young men waiting to enter the criminal world in order to make fast money, and the drug trade and other criminal elements will continue to flourish in favelas – evolving alongside Rio’s changing landscape.